If you're already bored with DC Universe Online for the PS3, you're probably better off using the disc as a coaster instead of trying to sell it. When a gamer gets bored with a console game, the accepted practice is to simply trade them in for credit or cash at a local game retailer. However, it turns out that this isn't an option with the PS3 version of DC Universe Online. QuickJump decided to look into rumors that PS3 copies of the game were married to PSN accounts once the included PSN keys were activated. It turns out the rumors are true. "Once the PSN key has been consumed with a disk it cannot be resold / replayed with the second user adding a sub. Only the original consumer can use that account," a Sony spokesperson said. "Disk and account are one." 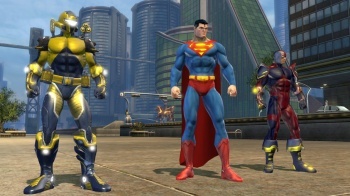 The reason for the inability to trade in the game is because DC Universe Online is an MMO. While this is standard operating procedure for PC games, it's pretty much unknown for this sort of practice to be used with console titles. One would think that Sony would let folks buy used copies of the game for the PS3 and then sell activation codes separately.